Description: Thallus foliose, to 10 cms long attached by thick stipe, broad blade, flattened and fan-like devides into broad sections, membranous and easily tearing. Without veins. Habitat: Epilithic, generally sublittoral, growing at 30 m depth. Distribution: Widely distributed on the south-western coasts of the British Isles, has been recorded from the north of Ireland and Scotland. Europe: Portugal, Atlantic coast of Spain and France. Similar Species: Haraldiophyllum bonnemaisonii and other fan-shaped species. Morton, O. & Picton, B.E. (2016). 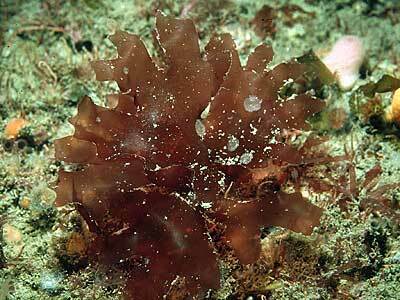 Drachiella heterocarpa (Chauvin ex Duby) Maggs et Hommersand. [In] Encyclopedia of Marine Life of Britain and Ireland.